A biological opinion is the document prepared by NOAA Fisheries or USFWS (referred to commonly as the Services) as part of the formal consultation process, to be issued at the culmination of this consultation process. 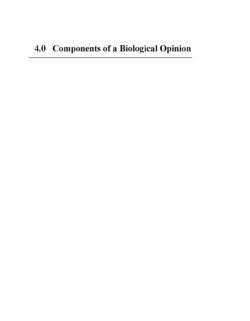 This chapter provides a brief overview of the components of a biological opinion. 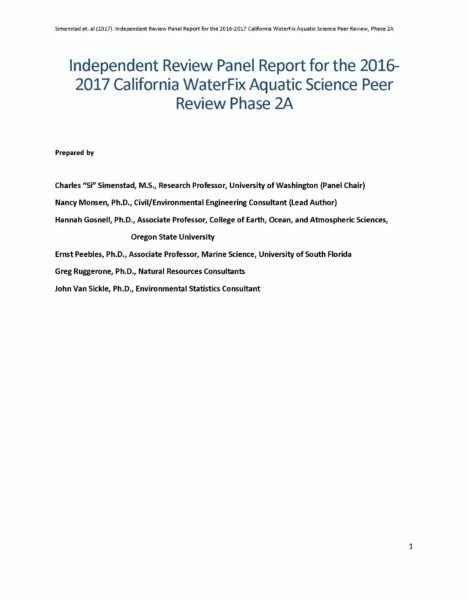 This report presents the Phase 2A findings of the 2016-2017 California WaterFix (CWF) Aquatic Science Peer Review. An Independent Review Panel (Panel; Appendix 1) was convened by the Delta Science Program to provide the National Marine Fisheries Service (NMFS), U.S. Fish and Wildlife Service (USFWS), and California Department of Fish and Wildlife (CDFW) to obtain the views of experts not involved in the CWF Endangered Species Act (ESA) consultation and 2081(b) permit on the use of best available scientific information as it pertains to analyses of effects on aquatic California ESA (CESA)-listed species in the California WaterFix Incidental Take Permit Application [2081(b) application]. The agencies further requested review of the Adaptive Management Framework proposed to integrate future scientific research, monitoring, and decision making during construction and operations of CWF. Accordingly, the Panel was charged specifically with reviewing: (1) the draft Adaptive Management Framework for CWF and (2) the 2081(b) application analyses of the CWF impacts of take for winter-run Chinook Salmon, spring-run Chinook Salmon, Delta Smelt, and Longfin Smelt. After reviewing the charge (Appendix 2) and a set of prescribed documents (Appendix 3), the Panel participated in a public meeting in Sacramento, California on December 8-9, 2016. On the first day of this meeting, the Panel interacted with agency representatives following their presentations on the topics above. On the second day, the Panel communicated and discussed its preliminary findings to agency representatives and the public (Appendix 4). 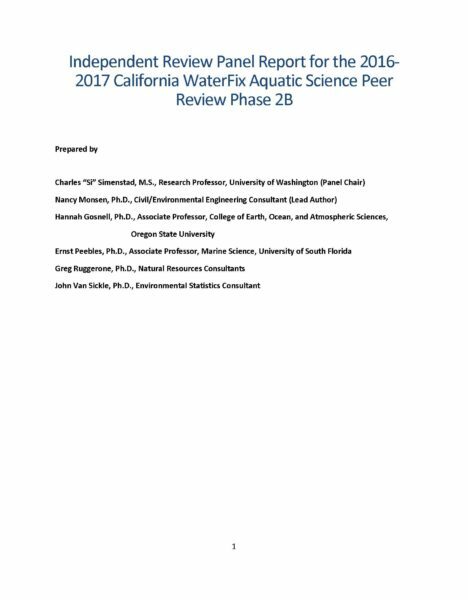 This report presents the findings of the 2016 California WaterFix (CWF) Aquatic Science Peer Review, Phase 2B. An Independent Review Panel (Panel; Appendix 1) was convened by select staff of the Delta Science Program to provide the National Marine Fisheries Service (NMFS), U.S. Fish and Wildlife Service (FWS), and California Department of Fish and Wildlife (CDFW) with the views of experts not involved in the CWF Endangered Species Act (ESA) consultation and 2081(b) permit on the use of best available scientific information in the California WaterFix Incidental Take Permit (CWF ITP) application. The agencies further requested review of the Adaptive Management Framework proposed to integrate future scientific research, monitoring, and decision making during construction and operations of CWF. 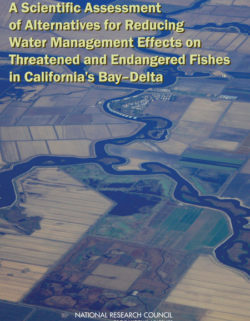 Accordingly, the Panel was charged with reviewing NMFS’ analytical approach and FWS’ analytical framework, status of the species and critical habitat, environmental baseline, and effects analysis sections of the draft BiOps on CWF for all ESA- and California ESA (CESA)-listed aquatic species and their critical habitat (see Charge, Appendix 2). After reviewing the charge and a set of prescribed documents (Appendix 3), the Panel participated in a public meeting in Sacramento, CA on January 23-24, 2017. On the first day of this meeting, the Panel interacted with agency representatives after they gave presentations on the topics above. On the second day, the Panel communicated internally and then discussed its preliminary findings with agency representatives and the public (Appendix 4). or destroy or adversely modify the designated critical habitat of the above salmon and steelhead species, or proposed critical habitat for Southern DPS of green sturgeon. This Opinion is based on the best scientific and commercial information available. NOAA Fisheries Northwest Region supports efforts to restore the ecological function of our region’s habitat. Restoring habitat contributes to the recovery of species currently protected under the Endangered Species Act (ESA), ensures that critical habitat designated under the ESA will serve its intended conservation role, and advances the conservation and enhancement of essential fish habitat (EFH) designated under the Magnuson-Stevens Fishery Conservation and Management Act (MSA). Significant modifications have been made to the historic floodplain of California‘s Central Valley for water supply and flood damage reduction purposes. The resulting losses of rearing habitat, migration corridors, and food web production for fish have significantly hindered native fish species that rely on floodplain habitat during part or all of their life history. The Yolo Bypass (Bypass), which currently experiences at least some flooding in approximately 80% of years, still retains many characteristics of the historic floodplain habitat that are favorable to various fish species. In approximately 70% of years, Fremont Weir overtops, joining flows from western tributaries. In approximately 10% of years, localized flooding is due to western tributary contributions only (DWR 2008, Woodland gauge, unpublished analysis). The primary function of the Bypass is flood damage reduction, with most of it also managed as agricultural land. The Bypass has also been identified by several State and federal entities as a potential site for habitat restoration to ease pressure on and increase benefits to threatened and endangered fish species. 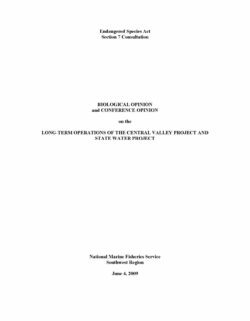 On June 4, 2009, the National Marine Fisheries Service (NMFS) issued its Biological Opinion and Conference Opinion on the Long-term Operation of the Central Valley Project (CVP) and State Water Project (SWP) (NMFS Operation BO). The NMFS Operation BO concluded that, if left unchanged, CVP and SWP operations were likely to jeopardize the continued existence of four federally- listed anadromous fish species: Sacramento River winter-run Chinook salmon, Central Valley spring-run Chinook salmon, California Central Valley steelhead, and Southern Distinct Population Segment (DPS) North American green sturgeon. The NMFS Operation BO sets forth Reasonable and Prudent Alternative (RPA) actions that would allow continuing SWP and CVP operations to remain in compliance with the federal Endangered Species Act (ESA). This Yolo Bypass Salmonid Habitat Restoration and Fish Passage Draft Implementation Plan (Implementation Plan) was prepared jointly by the California Department of Water Resources (DWR) and the U.S. Bureau of Reclamation (Reclamation) to address two specific RPA Actions set forth in the NMFS Operation BO: RPA Action I.6.1: Restoration of Floodplain Rearing Habitat, through the increase of seasonal inundation within the lower Sacramento River basin; and RPA Action I.7: Reduce Migratory Delays and Loss of Salmon, Steelhead, and Sturgeon, through the modification of Fremont Weir and other structures of the Yolo Bypass. 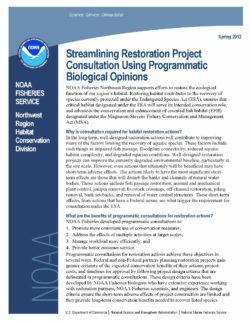 As mandated by the NMFS Operation BO, this Implementation Plan describes the activities, process, and timeline required to implement actions to address the requirements of RPA Actions I.6.1 and I.7. 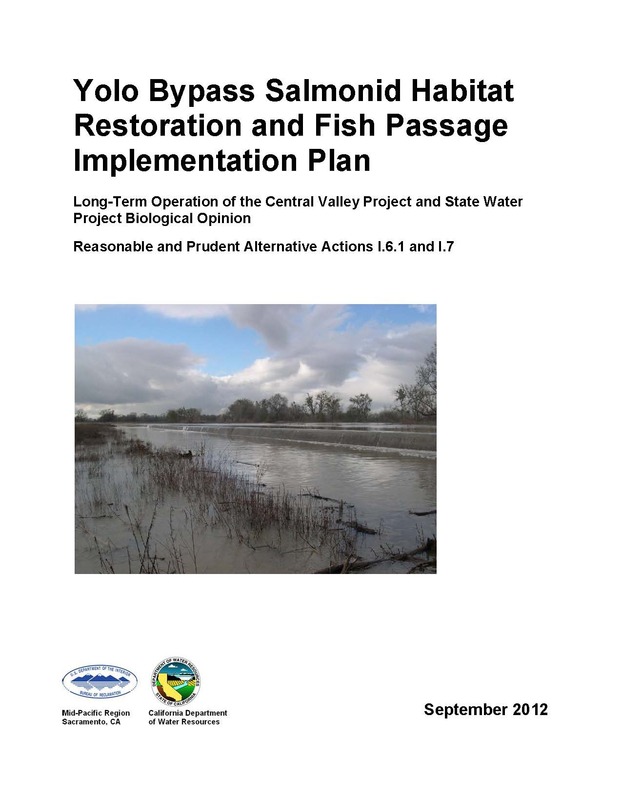 Major California restoration planning efforts over several decades (e.g., CALFED, the Bay Delta Conservation Plan) have focused on the Yolo Bypass as a prime area of the Sacramento Valley for enhancement of seasonal floodplain rearing habitat. The Yolo Bypass is generally seen as one of the best places in the lower Sacramento River Basin on which to focus implementation resources in order to achieve implementation of floodplain enhancements because of these efforts. Some of the technical foundation for these efforts has been well laid and interaction with stakeholders and local property owners has been initiated and is on-going. Implementation procedures related to RPA Action I.6.1 within the NMFS Operation BO specify that this Implementation Plan include an evaluation of options to "increase aquatic inundation of publicly and privately owned suitable acreage within the Yolo Bypass." 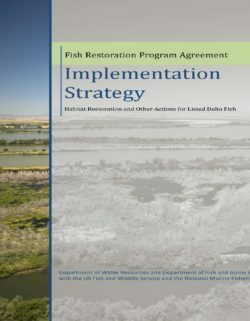 Therefore, this Implementation Plan focuses on restoration of floodplain rearing habitat within the Yolo Bypass to address RPA Action I.6.1. However, the planning and environmental compliance process will consider a reasonable range of alternatives for implementing this RPA action. Additional discussion regarding the availability and suitability of areas for seasonal floodplain inundation is provided in Section 6: Proposals to Refine the RPA Actions.